Print / File Electronically 1098 Tuition & Other 1099's. Prints on 1098 Tuition laser forms and on blank paper. Supports 1098-T, 1098, 1099-MISC, 1099-INT, 1099-DIV, 1099-R, 1099-S, 1099 (A, B, C, PATR) & 1099 OID Forms. Exports IRS 1098 T forms & W2 /1099 forms to MS Excel. No need to buy 1098-T Copy B For Student. Print on regular white paper. Save Money and Time. Great for universities, colleges and tax pros. Create 1098-T, 1098, 1099 & W2 forms in minutes. 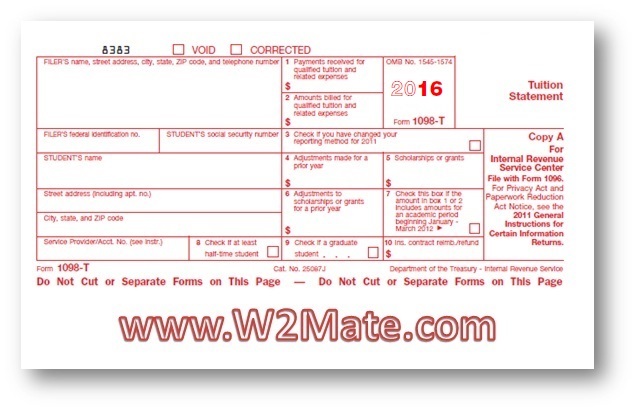 W2 Mate is a powerful W2 / 1099 software that supports a number of tax forms other than 1098-T. 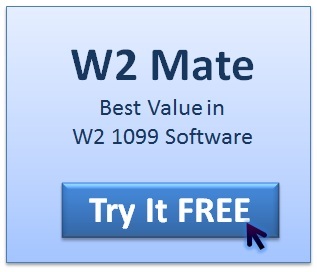 This page is dedicated to 1098-T, to read about the full capabilities of W2 Mate click here . Start printing now...Order our Software for 1098 T and receive instantly! 1098-T Copy B (1098 Tuition Copy B): For Student. 1098-T Copy C (1098 Tuition Copy C): For Filer. All these form 1098-T copies can be printed on blank paper with black ink. Laser Copy A of form 1098 T (1098 Tuition Laser): For Internal Revenue Service Center. Support for an unlimited number of 1098-T Filers and unlimited number of students, unlike other 1098 software applications! Exports 1098T data to Excel worksheet. Helps filers meet IRS 1098 Tuition reporting requirements. Upon entry of basic 1098 T recipient information, the program automatically populates 1098-T form, with data-entry screens using form replicas. Our 1098 T program, which can be installed on local workstations or networked servers, can be used either by colleges & universities preparing IRS 1098T forms in-house or by tax firms managing the 1098-T compliance needs of several clients. Password protection PLUS data validation. please visit our IRS 1099 Tax software page. Form 1098-T: Tuition Payments Statement is the IRS information tax return that colleges and universities are required to issue for the purpose of determining a student's eligibility for the Hope and Lifetime Learning education tax credits. If you use this method of reporting, use 1098T Software to enter the amount of payments received for qualified tuition and related expenses from any source during the calendar year. The amount reported is the total amount of payments received less any reimbursements or refunds made during the calendar year that relate to the payments received for qualified tuition and related expenses during the same calendar year. If you use this method of reporting, use 10-98 T software solution to enter the amounts billed during the calendar year for qualified tuition and related expenses. The amount reported is the total amount billed less any reductions in charges made during the calendar year that relate to the amounts billed for qualified tuition and related expenses during the same calendar year. Inside the 1098T Form screen check this box if you have changed your method of reporting (payments received or amounts billed). For Payments received: enter reimbursements or refunds of qualified tuition and related expenses made during the calendar year that relate to payments received that were reported for any prior year after 2002. For amounts billed : enter any reductions in charges made for qualified tuition and related expenses made during the calendar year that relate to amounts billed that were reported for any prior year after 2002. Enter the total amount of any scholarships or grants that you administered and processed during the calendar year for the payment of the student's costs of attendance. On the 1098-T tax form enter the amount of any reduction to the amount of scholarships or grants that were reported for any prior year after 2002. Use 1098 Tuition Statement software to check this box if any payments received, or amounts billed, for qualified tuition and related expenses reported for 2018 relate to an academic period that begins in January through March of 2019. Check this box if the student was at least a half-time student during any academic period that began in 2018. A half-time student is a student enrolled for at least half the full-time academic workload for the course of study the student is pursuing. Check this box if the student was a graduate student. If you are an insurer, enter the total amount of reimbursements or refunds of qualified tuition and related expenses that you made to the student during 2018. 1098 Tuition Form Who Gets What Copy? 1098-T Copy A For Filer to file with IRS (Internal Revenue Service ). 1098-T Copy B For Student to keep for their files/records. 1098-T Copy C For Filer or State Copy. Ready to print and E-file 1098 IRS Tuition Statement forms? Download a free demo of our 1098 T software now , enter actual students and see for yourself how easy and powerful this software is (make 1098 T in minutes). Although Intuit QuickBooks only supports 1099-MISC forms, our 1098-T software allows QuickBooks users import 1099 data and then map it into 1098-T forms with the ability to specify which box the money amount goes to. For example the user can remap QuickBooks 1099-MISC amounts stored under 1099-MISC Box 7 (Nonemployee compensation) into 1098-T Box 1 (Payments received for qualified tuition and related expenses). Once the QuickBooks data is imported as 1098-T data inside our software, the user can modify it, print it to laser 1098 T forms, print it on regular white paper or electronically file QuickBooks 1098-T with the IRS. Many schools, colleges and universities use Microsoft Dynamics (Great Plains). These educational institutions are required to supply the IRS with the pertinent information for taxpayers that are eligible to take higher education tax benefits. Since Microsoft Dynamics does not support printing and e-filing 1098-T forms, our software can import data from Dynamics and then allow the user to print student copies on regular white paper, IRS copy A on pre-printed forms and if required generate 1098-T electronic filing submission for reporting electronically through IRS FIRE system.